As Neil’s Heavy Concept Album had been unavailable for many years the Esoteric Recordings (Cherry Red Records) team took it upon themselves to restore this missing whimsical oddment and along with the customary re-mastering this reissue reprises the cassette version of the album, featuring additional tracks not included on the original vinyl version. In part, or perhaps for the most part, this is a well scripted release with the more obvious references to Nigel Planer’s down trodden, hippy character Neil, from the TV sitcom The Young Ones, along with more subtle references within the music itself. The Young Ones recorded twelve episodes and ran from 1982 to 1984, at the end of which Nigel Planer released a version of Traffic’s 1967 chart single Hole In My Shoe. Oddly enough both the original single and Neil’s cover achieved the No 2 slot in the British charts. Planer also took his alter ego Neil on tour, notably with Marillion. Perhaps spurred on by the success of the single and the shows Nigel Planer and WEA International went on to release Neil’s Heavy Concept Album in 1984. Initially mooted that Marillion might be the musical background to the album, however at the suggestion of Jakko Jakszyk, the legendary Dave Stewart (Egg, Hatfield And The North, National Health, Bruford…) was drafted in and took control of the project. An excellent move ensuring the music would not only be well written and charted, securing the attention to detail along with the inclusion of the subtle intricacies that raise this relase above a novelty offering. Something I fear may have been lacking if the project had been undertaken purely by session musicians, as is often the case with such novelty recordings. 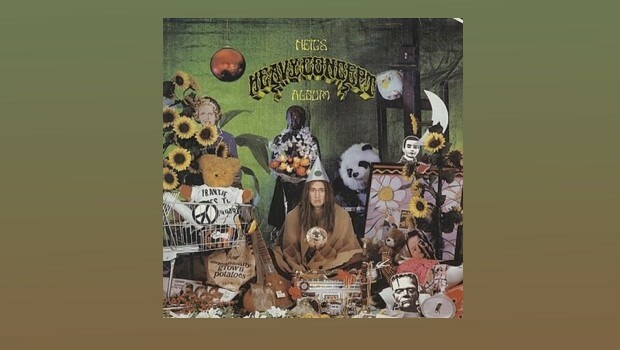 Neil’s anarchic hippy character was well suited to the late 60s early 70s approach of the album, drawing from the late 60s psychedelic movement and the early Canterbury scene. Neil’s Heavy Concept is a mixture of spoken word and mini sketches interlaced with musical snippets and a few well chosen songs. After the brief Neil’s “Hello Vegetables”, somewhat apologetic introduction we move into the single which kicked it all off and an obvious choice. Musically it works rather well and recalls Viv Stanshall and the Bonzos. The track fades with strains of The Beatles Strawberry Fields Forever, albeit played on guitar. As mentioned earlier it is the arrangements that make this album and Caravan’s Golf Girl is proof positive. Annie Whitehead’s strident trombone along with Jimmy Hastings’ flute bring that extra authenticity to the early 70s Canterbury music scene. This is superb version of the original and although Nigel Planer is no singer, he carries this off rather well. Again the song’s outro touches again on The Beatles, this time with I Am The Walrus. The spoken comedic parts include Dawn French who guests as the fairy godmother – policewoman. Elsewhere on the album Tomorrow’s My White Bicycle (67) gets a spin out as does The Gnome from Syd Barrett-era Pink Floyd, although it turns out to be one of the least successful tracks on the CD. Donovan’s Hurdy Gurdy Man receives two airings, firstly as part of the original album and is reprised as part of the bonus tracks – Hurdy Gurdy Mushroom Man was in fact the B side of the Hole In My Shoe single. The version from the original album is well written and an enjoyable listen, the bonus track – isn’t. The Incredible String Band’s A Very Cellular Song (68) lends the foundation for The Amoeba Song. As with the songs from the album, the artwork can be taken on several levels with visual references to The Rolling Stones Their Satanic Majesties Request album and The Beatles Sgt Pepper’s Lonely Hearts Club Band – (including cut-outs). Despite the title there’s no real heavy concept here, however the album is far from being a thrown together, money making venture and throughout demonstrates the detailed thought that has been given to the music. The inclusion of prominent figures taken from within the Canterbury and progressive fields, including Dave Stewart, Jakko Jakszyk, Gavin Harrison, Pip Pyle and Jimmy Hastings, raises the bar, however I can imagine this album will remain a take it or leave it sort of release. The album proved to be a lot more enjoyable than I had anticipated, however I was never a huge fan of the television series and as a novelty release it neither satisfies the humour nor the music fully. Still, I feel sure there are many that will welcome this release and hats off, as always, to Esoteric Recordings for re-releasing this album once more.